Bored? With weekends free, LBB’s list of hobby classes in Noida is here to help you brush up on those marketable skills. You can also hone that talent you’ve always felt you had with these great places to learn the arts. Teaching hand building to all pottery lovers, be it kids or adults, Claying Thoughts encourages the use of hands and fingers to provide shape to clay. With this course you can learn to create home decor items. They are also teaching in batches of four so that more individual attention can be given. These guys also do corporate workshops for those looking for team building activities around town. For regular updates, follow their website here. ZipOut has time-slotted batches for people interested in various different kinds of dance. These are all mostly contemporary dances like Salsa and Bollywood. If you want to just find a workout class, ZipOut’s got Zumba and spinning classes too. Even kids can find something fun to do on a Sunday morning here. With yoga studios splattered across Noida, The Yoga Guru is the place for students of all age groups to take interest in and learn all the asanas. To regain your flexibility, reunite with your mind, or target any particular ailment, Yoga Guru will train you in specific ways to focus on different areas. They also do corporate yoga for those looking to break away from the tedium and utilise their time in a better way. Where: For a complete list of studios, click here. Though you can learn classical and contemporary western music in all areas at School of Rock, we recommend the drums or the violin. They teach keyboards, guitars and vocal as well, but we hear good things about their drums classes. They have a structured course outline and term-end exams. So you’re in it to win it, rockers. Our favourite bakery also offers an amazing baking and cookery class. They teach making confections and yummy cookies, cakes, and pies. They’ll also teach you how to make ice-cream, should you so wish. In their cookery section, they have a range of cuisines like Italian, Mexican, Chinese, and sides. We love their jams and mocktails. Sign up, maybe? For more details and for schedule announcements, stay tuned here. Sunil Kumar takes these classes September onwards, so bookmark this for a little later. 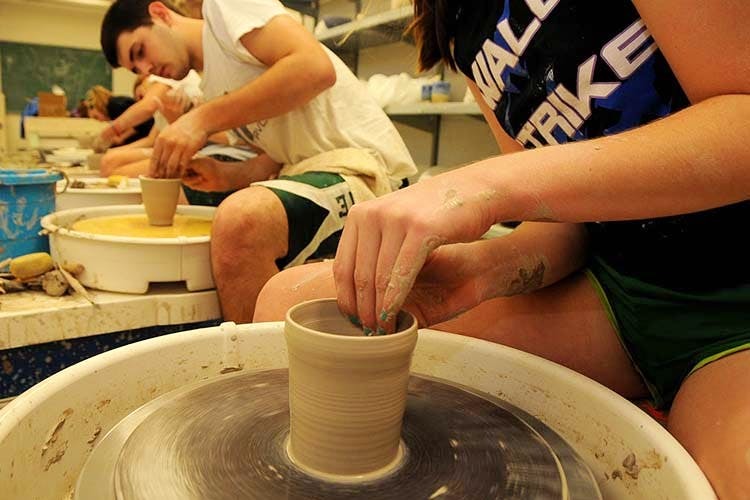 Other artists are invited for special classes where techniques like throwing and coiling are taught. The course is designed to keep students interested in ceramic pottery and thus, the history is discussed and various demos are given. There are specialised classes for mural and mask designing and you can also book the studio for its facilities. You can opt for curriculum based classes for jazz at Stance in Noida. They have different batches for kids and adults and these are all mostly level based, so you can go in for classes that suit your skill level.